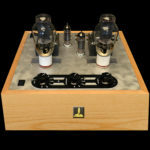 Directly heated triodes like the 2A3 output tubes used in the Stereomour II amplifier are exceptionally linear, which contributes to a DHT amp’s great sense of realism. 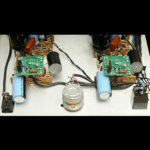 One of the challenges of designing a fully capable DHT amp is to make the preceding driver stage as close as possible to the output stage in terms of linearity without sacrificing gain. We use a couple of different means to optimize the performance of the driver stage. The stock Stereomour II amplifier uses our well know Camille Cascode Constant Current Source (C4S) to regulate current through the 12AT7 driver tubes. 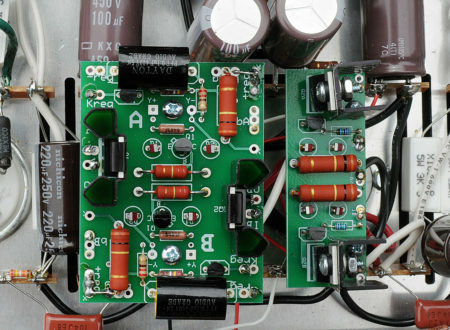 This gives the first amplification stage exceptional isolation from power supply ripple for low noise, and creates a very high impedance load on the tube to elicit the maximum gain from the driver stage while keeping the tube in a linear operating condition to higher input signal levels than a typical resistor loaded driver stage. The Stereomour shunt regulator upgrade kit adds shunt voltage regulation to the C4S loaded driver stage with the application of the same hybrid shunt regulator circuit used in our premium Kaiju 300B amplifier, BeePre 300B preamplifier, and Mainline headphone amplifier kits. This hybrid tube/solid state regulator tightly controls the supply voltage to the C4S current source loading the driver tube, creating a sense of greater bandwidth and better dynamic performance. “Installed the shunt kit today (after DC Filament and volume pot upgrades). The other upgrades were cool, especially the DC supply, but the Shunt regulation! Good grief! Fired up right after the voltage checks, and with about an hour or two warm up, the amp is sounding absolutely stellar. I mean whole new ballpark, stellar. I thought the amp sounded good previously. Not quite up to the level of my KT88 SE monoblocks, but hey, each of those weigh more than the Stereomour. Now they’re punching in the same class! Please note that this upgrade is only to be installed in the Stereomour II. The original Stereomour uses a different tube configuration that is not compatible with this upgrade.